Sadly Jimmy Lomax never got the breaks despite having a very fine voice complete with some lovely Sam Cooke style inflections and a tone that puts me in mind of the great Bobby Harris. His version of the country classic He’ll Have To Go is about as intense as you can get – note also the wonderful playing of the Big Apple session guys. 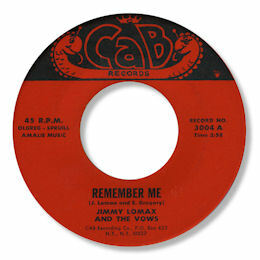 But his other great deep effort, the self-penned Remember Me is even more concentrated and powerful. No horns on this one just a stripped down rhythm section but that puts even more emphasis on Jimmy’s heartfelt vocal. You got to love the rumbling bass guitar fills and the tasteful guitar/organ combination too. UPDATE ~ My friend Greg Burgess has written with some new info - "The Camille Lomax issues appeared in 69 & 70 respectively but were probably cut in 64. 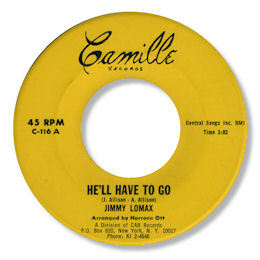 Since virtually everything else on the label originates in the West indies I wonder if Jimmy Lomax is from the Antilles." Can anybody confirm this? FURTHER UPDATE ~ My friend Naoya Yamuchi has written to say that from the matrix number the two sides of Camille 128 were pressed in late 1971 and early 1972. But from listening to the tracks he - and I - think that the dates given by Greg above are much more likely for the date of recording.